The 2010 piece Thorns in the Garden was installed at Mobius in Boston for the Alternative Experimental Flower Show. This installation explored the idea of our telecommunications as seeds in the galaxy and nuclear explosions as floral shapes resembling those galaxys. The work consisted of a 3 minute video loop containing atomic bomb file footage, time lapse flowering buds and images from the Hubble telescope. 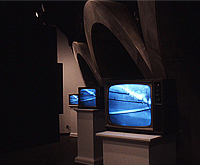 The video monitor was suspended from the gallery ceiling and was viewable through a telescope. As part of the installation an edition of custom seed packs were created and given away to gallery visitors. Installed overlooking the Bucknell University campus this installation consists of monitors that display static images from nearby pathway. During the day the artist's action of defining the routes taken by students by attaching black tape to the windows are recorded. 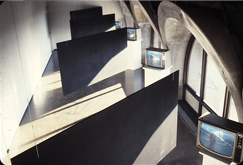 The video is played back during the evening, showing the construction of the taped window pattern determined by student destinations. Installed at the Wilmington, DE. State Office Building. This piece invites spectators to stand on low platforms that reveal the vertical lines on the windows are in alignment with vertical elements in the cityscape beyond the glass. Two staircases were constructed on site at Albright College; one beginning in the basement and extending through the gallery floor, the other beginning on the gallery level and extending to the ceiling. Cameras and monitors give basement visitors a view of visitors to the gallery space and the gallery ceiling monitor gives a view of the basement. This piece, from 1979, was in response to the increasing use of surveillance which to the artist seemed to be increasing exponentially. The staircases dimensions follow a logarithmic change in dimension. A site specific work concerned with the idea of common or public area and the encroachment of private enclosure. In this piece which consists of over seven miles of surveyors tape, Art Park, located in Lewiston, NY., was enclosed by the artist. In this case the appropriation was a temporary claiming of public space for personal use. This staking claim declared everything within the boundary to be the artist's work by appropriation.